Categories > Let Me Introduce Myself... > New TMF theme? Looks good but probably too bright/white for some eyes. I wear glasses so I have no problem but I have been to some other forums and some people said when there was a big change in themes that it was too bright for them... I hope that is not the case here. I can't see them at all. The Add Reply buttons are washed out as well. 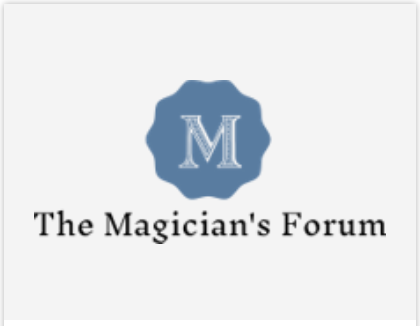 I'm messing with the look of the forum because I had to have a new logo created for the Magician's Forum in order for me to have some business cards printed. The logo that I had originally made was not very high in quality and won't seem to work well with Vista Print. Anyway, I have fixed the font colors for the Add/Reply buttons and the "Post New Topic". We'll see if the new look is well received. I know that it's very subjective, but I kinda like it. I still think that it looks simple, but somewhat elegant. I tried the one with the grey background, but didn't like it. I like the white color..it's cool. Good choice Rudy. Gray was not good. It'll take some getting used to, but we humans are adaptable. One of the options had a splash of color. It looks nice on a business card. Would it be better than black? Black looks better in my opinion. I like the black better, too! I love the new logo but the white background on the page is pretty stark. I thought the old black background was distinctive and classy. The new look is a bit industrial. Regarding the new logo: the M looks to be slightly off-centre. Is it just my eyes? Yes put the black background back please. It was so much easier to read. I haven't been on much lately with school, but my semester just finished up and I was surprised to see the new logo! I dig it! Only thing I would change is the font. I think Arial would be a better choice. Looks a bit like I'm staring at my computers terminal, which even that I have changed the font on to something a bit easier to read. Black on white is generally best for the body design of a web page, so I think the colors are fine. Anyways, just my opinion! Black is far better than Grey. But the Blue is very Okay. Overall, I think I prefer the Blue. And I agree with luigimar: Some buttons require more focusing than they should. Pleased to see that "Add Reply," "Preview Post" and "Cancel" are back to their old/original visibility. White on Black On White. Very clear. I think the off center "M" is an optical perception thing. Since the downward "legs" of the M are of different widths, I see it off centerline to the right. I'll leave it to Rudy to check his spacing. I was surprised by the new look. I figured I missed the announcement, but since I am on and off TMF at least five times/day I just went with it. As the owner/admin you get to make it look any way you'd like. It's no so different that I am off put by the changes. It looks nice. I just realized that this may have sounded like mindless rambling. I apologize. It's a medication thing. I wondered if the apparent off-centre location of the M was an optical illusion ... but I lined up the vertical edge of a playing card on the left-most point of the left foot and then on the right-most point of the right foot - they definitely don't intersect the border at the same relative position. But as you correctly say, it's Rudy's forum and he can design the logo to his own satisfaction - I like the new logo very very much and I was not intending a criticism of it. I really like the logo! My curiosity has been aroused with regard to the new logo, and the 'centralisation' of the 'M'. I hope I've helped in this matter. I enjoyed the exercise! Like someone else has previously mentioned above ... This is Rudy's forum, and consequentially, he can do whatever he likes with it ... I'm just glad, and lucky to be part of it, idiosyncrasies and all! ... And yes I know, ... I've got to get a life! Lol. People around me have observed that I am obsessed with symmetry ... so I think your adjusted version looks perfect! Nice work! Hi William, thank you for taking the time and energy to investigate the symmetry of the logo. I thought that it was an optical illusion because of the placement of those tabs at the upper right-hand corner of the forum. I am not sure if the logo is intentionally offset that way for artistic purposes. If you can send me the adjusted logo, I can update the forum with it and see how it looks.